All I can do is try to laugh at it all, life that is. When I was forced into medical, and stress related retirement 10 years ago, a social worker from SS Administration told me off. Speak up for yourself because nobody else will. Have faith in yourself. You and only you and your maker if you believe, are the only ones who know what is inside each of us. Boredom lately has hit hard, the feeling of uselessness or powerless. Put any human in front of me and I will still try to pass. So can you. I have been told a couple of times that I will die soon, to get my affairs in order and check into the hospital. So I got another opinion. Pneumonia 3 times, having a stroke? Different doctors have different abilities and approaches. Do doctors live forever? Can they read the future? Recently, quite a few funerals almost brought me down. Including 6 suicides in 6 months. Why? Is it really within our own means or intentions to end our lives? We have a conscious, a spirit that we will never really explain or know of other than in our imagination or dreams. I saw so much death and blood in Vietnam as to permanently affect me this whole lifetime. PTSD. I am cautious, I fear pain, I know love, caring and wanting the best. Have I mistreated others by these experiences? Yes. Regrets few if any, I did as was necessary to the best of my ability, to be strong, to survive. Not always as happy as I could be, still the satisfaction of integrity, honesty and personal inner values have got me past each days problems, to which a week later who even remembers. A double entendre we used in the military, in the field the motto was. 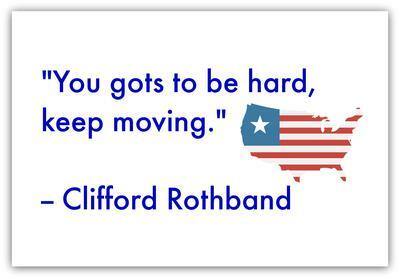 "You gots to be hard, keep moving." Be it a friendship, relationship, marriage, children or work; do it to the ultimate best whether you like it or not, Get Up and Keep Moving. Nobody else can do it for you or your way. I hope you keep moving for a long time. You've got the spirit and your words have encouraged me to get up and get moving. I have become housebound in the miserable heat of the Central plains. Need to get out and walk- stress, diabetes and arthritis care calling for it. Best wishes to you. Thanks for the advice. Thank you for your post! I can relate to some of the things you mentioned! I retired Aug 11, 2017...first 4 month thru 8 were ok (Traveling and taking it easy) then Month #9 to present time ..."What the hell happened"
I need to get another part time job? or volunteer. You start thinking about life a lot, when you are in the ER. Thanks again for sharing your experiences! We are not getting off this earth alive, so let's stay alive and do good for the world! Oh my, sorry for so many tragic losses. Your post has helped me. So you are here for a reason, maybe it is to post. Clifford, that is a great motto. I can't imagine the horrors you experienced that you carry with you. Good luck as you carry on.